“He has something wrong with each tooth,” the dental student said in amazement. “He has to be in constant pain.” I nodded my agreement, not really surprised by the news. I’m the principal of Victoria Elementary School in San Bernardino, where the dental student was assessing Eric’s oral wellness as part of the annual fall screening we bring to all 500 children in our student body. 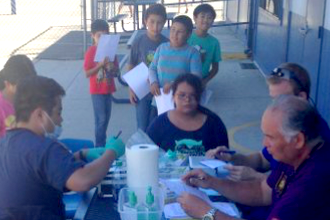 In partnership with Loma Linda University’s dental school, which triages the worst cases and then follows up weekly with their mobile clinic, this program treats our students throughout the school year. For many kids, it’s the only dental care they receive. Eric had a bright, cheerful demeanor and near perfect attendance, making it all the more incredible to learn that he’d been living in pain. Thankfully, the dental school put Eric and his sister at the top of their patient list—after two years of treatment, their dental health is finally approaching normal. Eric and Madeline’s circumstances are not unique at our school. In our zip code, half of the children live in poverty, according to the U.S. Census. Almost monthly we have students undergoing extractions of abscessed teeth caused by bacterial infections, which, left untreated, can spread to the jaw, neck, and brain causing even more serious medical conditions. Victoria Elementary School students receive dental check-ups. To me, Eric’s teeth represent a problem in the way we measure whether we are providing economically disadvantaged students with educational opportunities on par with their wealthier peers. In addition to academic support, we must factor in the many needs of our children beyond the classroom. Are they hungry? Did they sleep? Basic necessities cannot be assumed when dealing with poverty because we know that hungry and tired children do not perform well in class. In 2013, Gov. Jerry Brown shifted state educational funds to allocate more per-pupil to students from low-income families, and to increase local control. This shift will enable Victoria to expand the range of services to support our students. Starting this school year, we now have a person dedicated to following up with students in everything from school work, basic needs, and most importantly, emotional support for the psychological effects of poverty. I was introduced to Victoria Elementary seven years ago, when a colleague called it a “hidden gem.” Through a fluke of geography, Victoria is located in San Bernardino, but it’s part of the neighboring Redlands school district. The differences are stark. Redlands, a city in the top 100 best places to live in California, is a “destination district.” It’s where teachers want to teach, students want to learn, and parents want their children to go to school. Transfer requests are many and successful transfers are highly coveted. San Bernardino, on the other hand, is third from the bottom on that same list of 240 cities. Poverty is high. Security is uncertain, both in terms of personal safety and food security. Given the unmet needs in this community—needs as fundamental as food, clothing, and shelter—I consider myself lucky that when I took the principal position at Victoria, I inherited a Family Resource Center (FRC) on my campus. 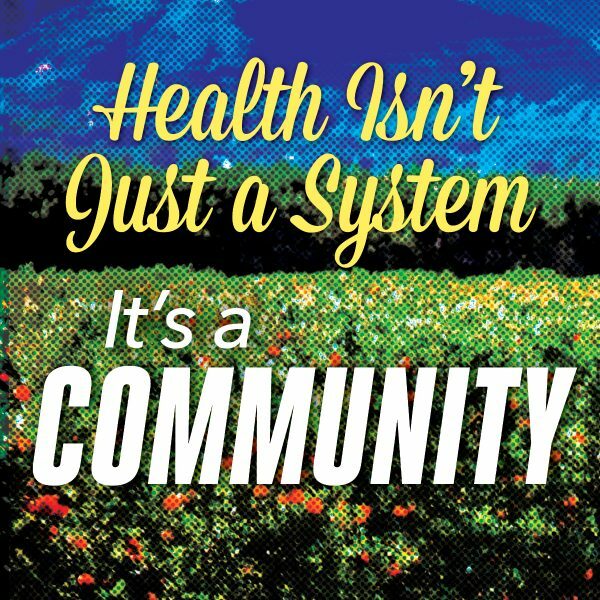 The FRC is our hub for community outreach. Originally funded through California’s Healthy Start Initiative, Redlands Unified has retained four FRCs across the district. Staffing duties are shared by a case manager from a local charity and a school worker. Working in a community where many lack the basics, I’ve come to learn that poverty doesn’t mean impoverishment. The families that make up the Victoria community are generous with what they have. Neighbors often walk each other’s children to school. It’s also common for them to open their homes to one another so that parents have a place where they can leave their children before starting their early morning commutes to work. Even with this esprit de corps, more is needed. Addressing hunger is one of the most vital issues we deal with. The school, formerly surrounded by orange groves and strawberry fields, now lies in the middle of a food desert. Many of our families don’t have cars, and public transit is both slow and sporadic, especially on weekends. There’s a liquor store nearby, but the nearest market is a five-mile round-trip walk. More than 90 percent of Victoria’s students participate in the National School Lunch Program and receive free or reduced meals. Every Wednesday, a local church brings in bread donations from the Panera restaurant chain, which the children are free to take home. On Fridays the kids start the weekend with bags of groceries provided through the United Way’s Backpack Program. Sometimes it isn’t enough, so we run our own food pantry to help families who run into emergencies. Several years ago we transformed an unused space outside a kindergarten classroom into a vegetable garden. 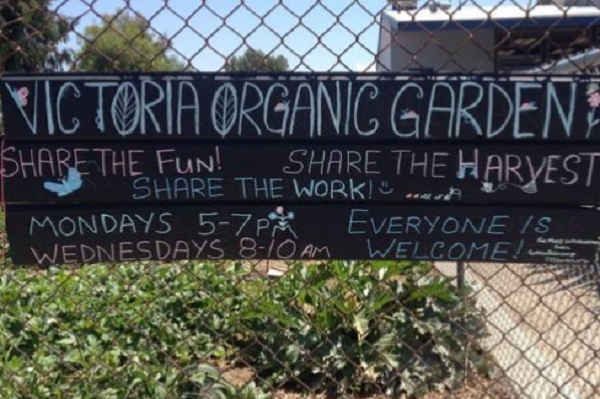 Through local grants and the tireless efforts of several teachers and our after-school coordinator, children helped plant and sow lettuce, chard, and cauliflower. We use the fruits of their labor in our school cafeteria and we send some home with the families who help keep the garden maintained. Some of our families cannot afford to buy their children shoes. Seeing first graders shuffle around in adult-sized shoes is not uncommon. At the start of this school year, Kim, the assistant principal, stopped at a local Payless to buy a fifth- grader and her brother new shoes. The last time they got new shoes was when she and I took them to an Assistance League-sponsored shopping trip last March. I think these are the only times these children have had new shoes. The emotional effects of poverty are more hidden, but no less insidious. Simply put, poverty hurts—physically and emotionally. With a school full of young children, we see a lot of separation anxiety, which our staff is well equipped to handle. But for deeper emotional trauma we seek outside help. When Nathan’s mother was battling cancer, I would fish him from her car and Kim or I would sit him in the office. Some days we could get him to class; other days we couldn’t. It was only after our case manager from the Building a Generation charity arranged counseling that his anxiety got better. Families do what they need to survive. Often, this means doubling or even tripling up in a house. This creates a host of scenarios I never encountered as a solidly middle-class kid growing up. At the milder end, it means their children are left in the care of older siblings or roommates with whom families have banded together to pay rent. At the more extreme end, arguing or abuse in the home in one form or another can result. We work with students and parents who themselves are working through their varying levels of anxiety or depression or worse. Some families handle it well and others struggle. Some self-medicate. I tell our teachers that we can’t control what happens at home, but we can control how we react to it. The first thing we remind each other is: “Don’t confuse issues of poverty with issues of morality.” Simple things like homework completion need to be viewed through that lens. Does the student have someone who can help her with her homework? Does she even have a place where she can work? More than a few teachers let students stay after school to do their homework. Every child needs a champion. The daily encounters with our parents and students are as important as any academic, medical, or social service at our school. I am often outside at arrival and dismissal times. Not only is this a great way to welcome or say goodbye to students, it gives our parents easy access to the “person in charge.” For every sit-down meeting I’ve had with a parent I’ve had two curbside conferences. The level of familiarity is important. Not only does it relieve parents to know that I watch over their children, but it helps create a sense of community that everyone belongs here. It’s easy to get lost in the enormity of the conditions in which we operate. Many of the problems, such as affordable housing and jobs with livable wages, are beyond our power to solve. However a sense of belonging is what gives us the tenacity to not only carry on but to help our students be resilient. Poverty makes it harder to succeed, but it is by no means an insurmountable barrier. Parents understand that we are on their side and their gratitude is evident every Teacher Appreciation Day when there is no shortage of flan, pan dulce, or tres leches cake for the staff. 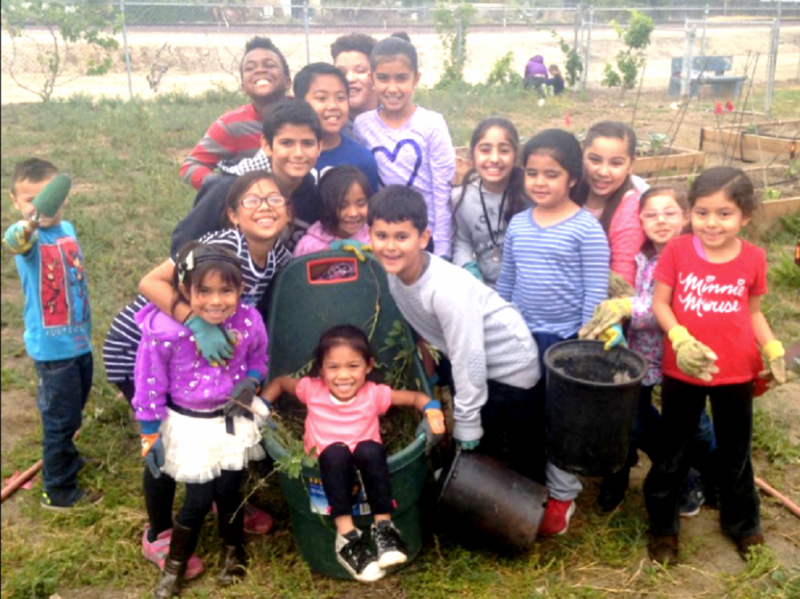 *Lead photo: Victoria Elementary School students pause from their work on the school’s vegetable garden. All images courtesy of Victoria Elementary School.